Despite significant advances for gay and transgender persons in the United States, the public school environment remains daunting, even frightening, as evidenced by numerous high-profile incidents of discrimination, bullying, violence, and suicide. 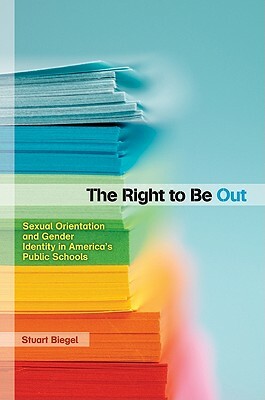 Yet efforts to protect the rights of lesbian, gay, bisexual, and transgender (LGBT) students and educators, or to enhance curricula to better reflect the experience of differing sexual orientations and gender identities, are bitterly opposed in the courtroom, at the ballot box, and especially in the schools themselves. The Right to Be Out begins with a cogent history and analysis of the dramatic legal developments concerning the rights of LGBT persons since 1968. Stuart Biegel then turns to what K-12 schools should do-and in many cases have already done-to implement right-to-be-out policies. He examines recent legal and public policy changes that affect LGBT students and educators in the K-12 public school system. Underlying all of these issues, he shows, is an implicit tension about the right to be out, a right that is seen as fundamental within LGBT communities today and, legally, draws on both the First Amendment right to express an identity and the Fourteenth Amendment right to be treated equally. Biegel addresses the implications of asserting and protecting this right within the hotly contested terrain of America's public schools. This book is a valuable resource for K-12 school administrators, parents, teacher organizations, mental health professionals and school counselors, LGBT advocacy groups, and the legal community. A safe and supportive educational environment for all students is possible, Biegel concludes, if built on shared values and a belief in the strength of our pluralistic society. Stuart Biegel is a member of both the law and education faculties at UCLA. He is the author of Beyond Our Control? Confronting the Limits of Our Legal System in the Age of Cyberspace and Education and the Law. He has also served as director of teacher education and special counsel for the California Department of Education.